Hand Reading Mini-Course - Sydney line (long head line) & syndromes with gene abnormality! Sydney line (long head line) & syndromes with a gene abnormality! Group 4: syndromes with an abnormality on a specific gene. 1 - De Lange syndrome (gene: unknown). 2 - Rubinstein-Taybi syndrome (gene: 16p13.3). 3 - Williams-Beuren syndrome (gene: 7q11.23). 5 - Prader-Willi syndrome (gene: 15q11-q13). 6 - Soto syndrome (gene: unkown). 7 - Russell-Silver syndrome (gene: unknown). The scientific literature presents 'phantom pictures' for: De Lange syndrome, Rubinstein-Taybi syndrome, and Williams-Beuren syndrome. In the first paragraph of this course was described that nowadays dermatoglyphic research is merely focussed on studying the etiology of complex diseases and syndromes. The etiology of many diseases is influenced by a large number of genes combined with environmental influences. Teratogen influences start being manifest during pregnancy. Examples of teratogen influences are: (high) age of the mother, food, stress, (infection) diseases, medicine, drugs, chemicals, and radiation danger. the ulnar side of the palm (the side of the little finger). 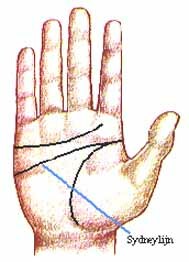 The Sydney line: a fascinating hand mark!